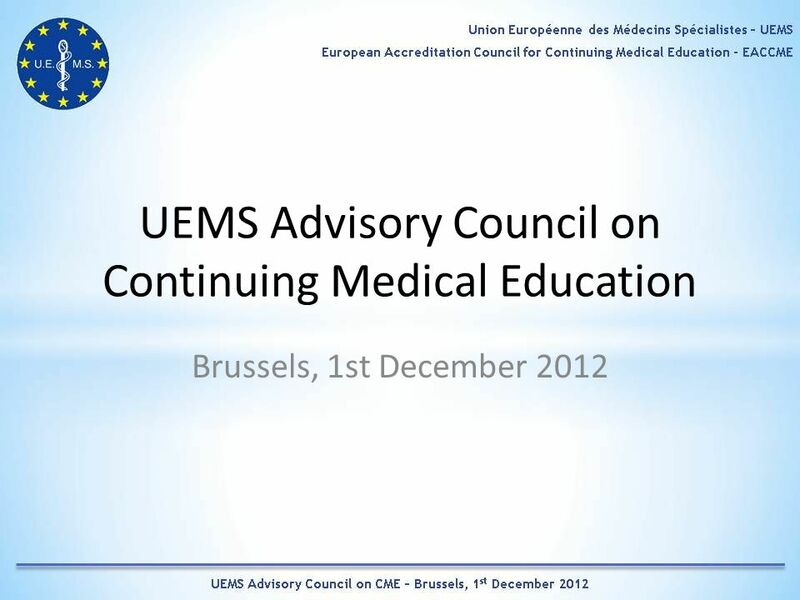 Download ppt "UEMS Advisory Council on Continuing Medical Education Brussels, 1st December 2012." UCSF School of Medicine OCME Program Frequently Asked Questions Faculty Disclosure and Resolution of Conflict of Interest. 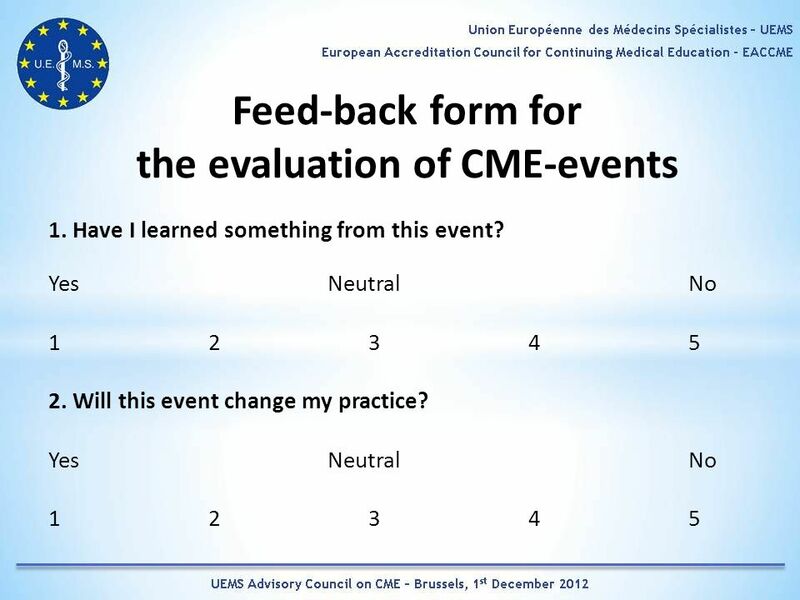 MEETING OF THE UEMS ADVISORY COUNCIL ON CME Brussels. 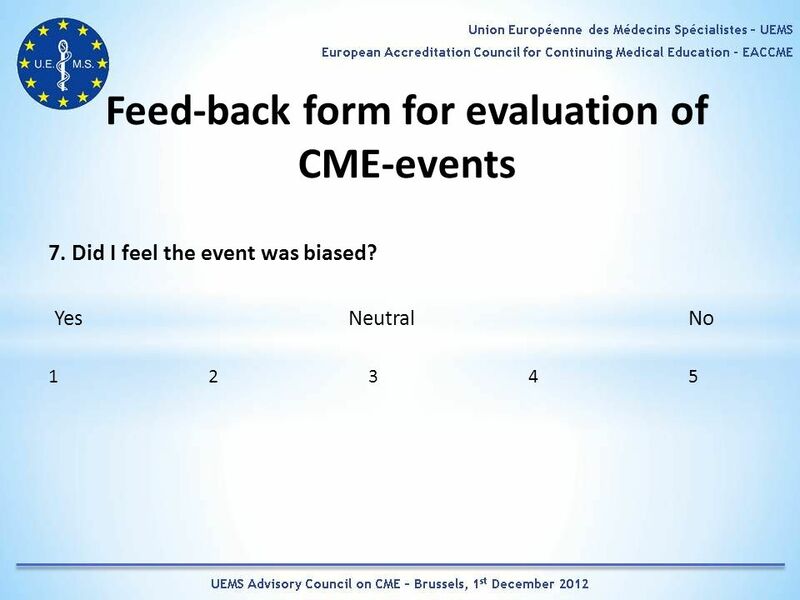 24 November 2007 CONFLICT OF INTERESTS IN CME HOW IS IT REGULATED ? Helios Pardell. MD Director of. 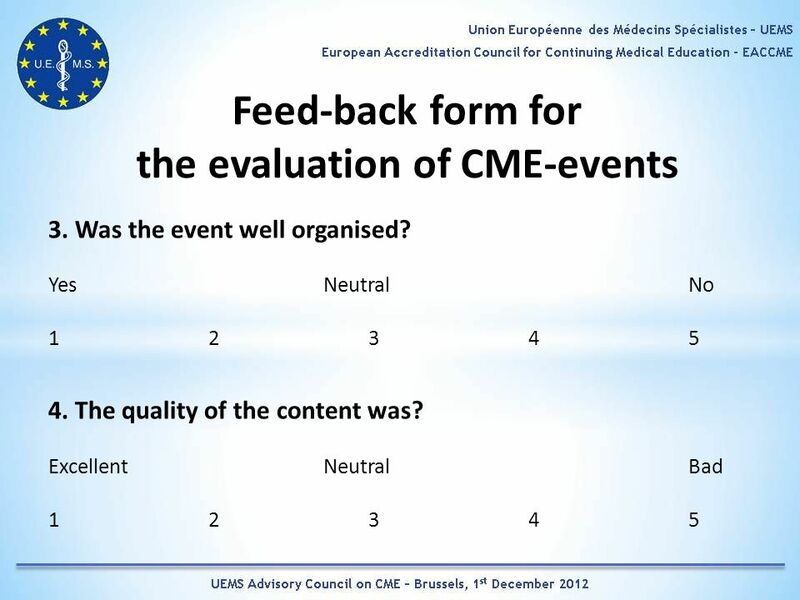 UEMS Secretary Generals report on the European Accreditation Council for CME. My Five Senses Created by:. 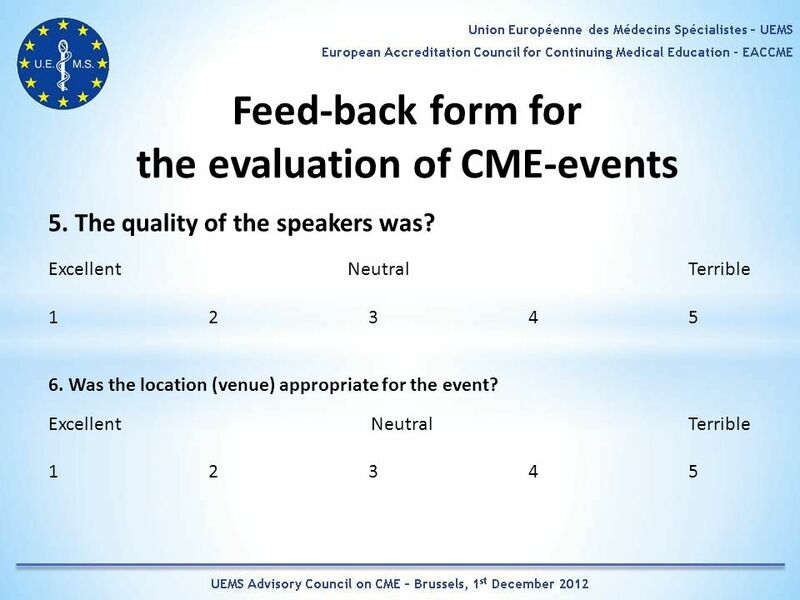 THE EUROPEAN UNION OF MEDICAL SPECIALISTS MEDICAL SPECIALISTS VOICE IN THE EU 1 UEMS COUNCIL SECTIONS & BOARDS PLENARY MEETING BRUSSELS, 20TH APRIL 2012. Library Review. Agenda for today Outline of Library Review Campus review process Development of Library Review framework Library Self Study stage Steps. © Quality Solutions for Healthcare Team Leadership Programme Betsi Cadwaladr University Health Board Workshop evaluation from 25 th January 2012 Debbie. ECF BP Presentation Validation Sheet Name:…………………………………………………………………………………………………………………… Organisation:………………………………………………………………………………………………………… 1. The presentation. MODERNISATION OF MINIMUM TRAINING REQUIREMENTS & COMMON TRAINING PRINCIPLES 1 GROWTH & MOBILITY – MODERNISING THE PROFESSIONAL QUALIFICATIONS DIRECTIVE. My e-learning journey so far E-living skills Use this box to describe e-living skills My personal e-learning experiences Use this box to describe if you. Appendix Materials Figures A-2—A30. Figure A-2: Potential Focus Groups Cabinet Campus Technology Council Chancellor’s Cabinet 2 Chief Administrators Officers. Why a LINks Stakeholder day? John Rutherford Director of Adult Services – Bolton Council. Saddleworth WI survey November Saddleworth WI is welcoming and friendly. Anecdote An anecdote is a short and amusing or interesting story about a real event or person. an anecdote. Public Speaking. Public Speaking We study public speaking because sooner or later all of us will have to open our mouths and say some- thing in a public.